Dislodged Tooth? Your Emergency Dentist in Waco Says Milk It! If there’s one thing we can all agree on, it’s that nobody wants to be thrust into a dental emergency. It makes for a traumatic experience that could have lasting effects. Still, it’s a fact of life that things happen, so it helps to know what to do in certain situations, like with a dislodged tooth. What should you do? As you read on, you’ll learn how milk factors into answering that question and much more! Several things can lead to a dislodged tooth. You may be involved in sports and get struck by a ball or run into another person. You could just simply be walking or taking a brisk jog and fall. You should clean your hands and then grab the tooth by the crown, the rounded part. You can rinse the tooth off and immediately place it back in its correct spot. The other option is to place it in milk until you can be seen to have it re-inserted. What Does Milk Do for a Knocked-Out Tooth? One of the benefits of using milk is that it helps to keep the tooth moist, which is a must for preserving it. Milk is better than water because it prevents the cells at the root surface from swelling and bursting. Also, inside milk are some of the vital nutrients that your tooth needs, like proteins that help to maintain the right pH balance and sugars that are necessary for continued cell growth. Keep in mind, though, that no matter how effective the storage is, you have a six-hour window to have the tooth re-inserted. 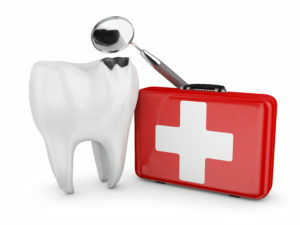 So the moment you stabilize yourself after the trauma occurs, you should be reaching out to your dentist in Waco. If you are involved in any type of contact sport, the best way to prevent having a tooth dislodged is to wear a custom-made mouthguard. It will provide a means of absorbing and redistributing some of the energy of you being struck in the mouth. If you find yourself in a dental emergency, remember to stay calm, reflect on what you’ve learned here and contact your local professional to get the help you need. A native Texan, Dr. Rick Cofer earned his dental degree from Baylor School of Dentistry. He has since gone on to provide the citizens of Waco with the absolute best in dental care. To stay abreast of the latest advancements in the field of dentistry, Dr. Cofer maintains affiliation with professional institutions like the Seattle Study Club and others. He practices at Premier Family Dental and can be reached for more information through his website. by: Dr. Rick Cofer at May 29, 2018 . Comments Off on Dislodged Tooth? Your Emergency Dentist in Waco Says Milk It!